CEO Meg Whitman makes just a $1 salary, but when stock, options, and other goodies are included, her total pay last year was a hefty $15 million. Contrast that with, say, Whole Foods' John Mackey: His total pay was just over $69,000. 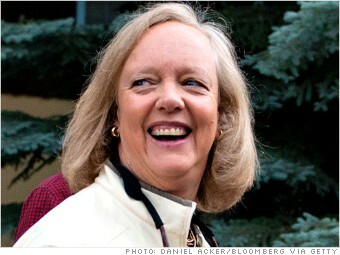 Whitman collects just a $1 salary at Hewlett-Packard, but thanks to stock and option awards, she's among the U.S.'s highest paid tech executives. Still, she took a slight pay cut last year, from $16.5 million in 2011. Total compensation is calculated as the sum of base salary, discretionary and performance-based cash bonuses, the grant-date fair value of stock and option awards during the fiscal year, and other compensation like benefits and perks. Equilar, an executive compensation research firm, looked at top executives of companies with more than $1 billion in revenue that filed a proxy statement as of June 30, 2013. Pay data based on companies' fiscal year 2012. See more on Meg Whitman from Equilar.